Mangrove produce large amounts of litter (leaves, twigs, bark, flowers and seeds). They produce about one kilogram of litter per square metre per year. This litter is eaten by detritus feeders. The strong odour smell of hydrogen sulphide in the mud is due to the presence of anaerobic sulphur-reducing bacteria which thrive in the low oxygen condition. Some of the detritus is consumed by crabs but fungi and bacteria are most important in making the food available to animals. These micro-organisms produce waste which, along with the even smaller mangrove litter, is eaten by molluscs, small crustaceans and fish. Even dissolved substances are consumed by plankton or, if they are on the mud surface, by animals such as crabs and mud whelks. Mangrove productivity is high compared to most other communities. 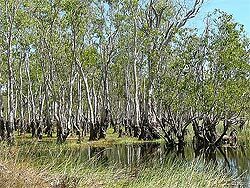 A teaspoon of mud from a North Queensland mangrove contains more than 10 billion bacteria. These densities are among the highest to be found in marine mud anywhere in the world and are an indication of the immensely high productivity of this coastal forest habitat. 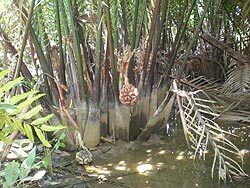 Mangrove roots offer a sheltered region for man young organisms. 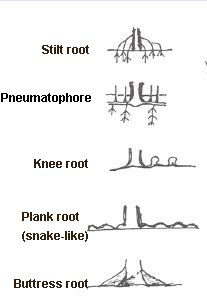 In areas where roots are permanently submerged, the organisms living there include algae, barnacles, oysters, sponges, and bryozoans. Shrimps and mud lobsters use the muddy bottoms as their home. Mangrove crabs mulch the mangrove leaves, adding nutrients to the mud for other bottom feeders. Mangrove forests also contain several salt-tolerant plant species which are not classed as mangroves. 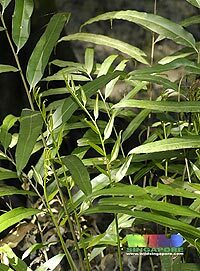 In tropical areas, this may include the Mangrove Palm (Nypa fruticans), the Mangrove Fern (Acrostichum speciosum), and orchids which grow on the trunks and branches of mangrove trees. Crabs are the most abundant and important larger invertebrate in mangroves. 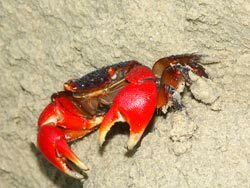 When building their burrows, crabs improve the penetration of ground water, water from high tides and freshwater runoff. This helps to flush out excess salt and reduce soil salinity. The burrows also increase oxygen levels in the mud by creating air spaces. Crab holes also provide a habitat for many organisms, including fish molluscs and worms. Crabs are vital to the recycling of nutrients, in particular nitrogen. Many crabs eat large amounts of fallen mangrove litter while other species eat algae and detritus. 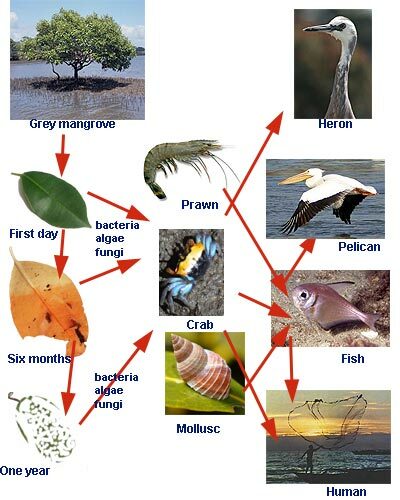 The presence of crabs in these ecosystems has been shown to improve the growth of mangrove plants, and also increases the biomass and diversity of other organisms. 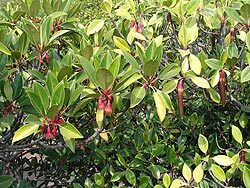 Different mangrove species have different requirements and tolerances. This will determine where they are found, that is they are found in different zones parallel to the shore or banks of tidal rivers and creeks. 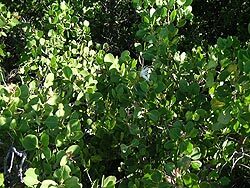 The grey or white mangrove is generally found closest to the water along with the mangrove apple. The red mangrove is usually found behind this zone where its long prop roots anchor it in wind and waves. The next zone is the part that is flooded only at times of very high tides. Yellow mangrove species are found in this zone. Conditions make it difficult for other species to survive here, other than saltmarshes or succulents. In tropical areas there may be regular flooding and freshwater swamps with less salt tolerant plants on the landside. 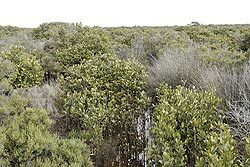 Sometimes there is a zone of paperbark swamps as the vegetation changes into rainforest. 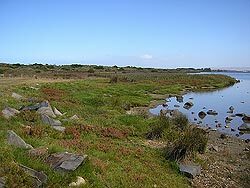 In other areas lower seasonal rainfall and greater evaporation could mean increased salinity, so there may be a saltmarsh.